Plein Air Sandwich is a non-juried plein air painting event. It starts starts with up to six hours of plein air painting at the artists' location of choice within the Town of Sandwich. Artists will return their finished work to the The Drunken Seal Restaurant by 1:30 p.m. People's Choice Award will be announced at the Cocktail Hour Show & Silent Auction that evening. All paintings will be displayed and for sale that evening at The Drunken Seal Restaurant from 5 PM until 7 PM. Come to a Plein Air Demo! 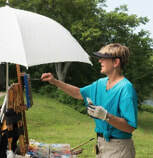 A demonstration of Plein Air technique, led by the very capable Mary Smith, will take place on July 18, on the deck adjacent to the Hoxie House overlooking Shawme Pond. The time is 10 a.m.- 12, rain or shine. For those who have been hesitant about committing to this event, this demonstration might be helpful in persuading you to give it a try. Another plus: the painting done that morning by Mary Smith will be the raffle piece at the Plein Air auction the afternoon of August 3rd. For your comfort, PLEASE BRING A FOLDING CHAIR to the deck.